My friend Lizzie makes beautiful bracelets that represent each of the countries Compassion works in. She has bought beads from each country that represent the different countries and weaves them together into a bracelet. She is doing it as a not for profit venture but she does get a little profit from each bracelet which all goes into supporting her Compassion International children. 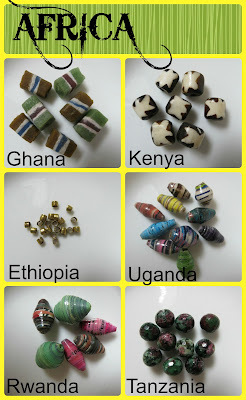 The bracelets are also a wonderful way to talk about Compassion's work and/or your sponsored children as each bead represents one of the countries that Compassion work in. You can get a get a bracelet with beads representing your specific sponsored children too; for example, if you had two sponsored children, one in Bolivia and one in Tanzania, then you could get a bracelet made with a Bolivian bead to represent your Bolivian child and a Tanzanian bead to represent your Tanzanian child. :) They're also a great bonus reminder to pray for your child/ren.